Profiles are primarily used to control the permissions for a user- see below. Standard profiles and custom profiles are essentially the same, except that the above 3 areas of configuration cannot be changed on a standard profile. Standard fields are created by Salesforce and packaged with the object. Custom objects are those that you create. Custom fields and objects always have "__c" appended to the API name. Side note: Custom related lists to have "__r" appended to the API name. Text (Encrypted) – Available by request only. Let’s say I have a field on my lead called "Page Source" (I have mutliple web-to-lead forms running; this page tracks which page the lead was submitted from). I would create the picklist field "Page Source" on the lead object, and then on the opportunity object, then head back to the lead page and map it over. Straight-forward. You select the options you want listed and those you do not by double clicking each of them. You can have many dependant fields, but only one controlling field. For instance, you can have the field "Type" control options for the field "SLA" and "Status"; however "Status" cannot have options that change based on "SLA" and "Status". Picklist dependencies work for Picklist and Picklist (Multiselect) fields only. Formula fields have an immeasurable number of uses. See the article "Useful Advanced Formula Fields" for some great examples. The key limitation of formula fields is that they cannot reference data in related lists. For instance, you cannot reference any information about the contact roles on the opportunity in a formula because contact roles is a related list, not a lookup (I’ve been burned by this!). The key benefit of a roll-up summary is that it performs math on data in related lists. The key limitation is that roll-up summaries are only available for data in a master-detail relationship. You can only set filter criteria for records to enter into the summary. Example: Create a field on account that displays the total of all opportunities won for the account: Create the roll-up summary SUM of opportunity.amount and set the filter criteria to stage=won. 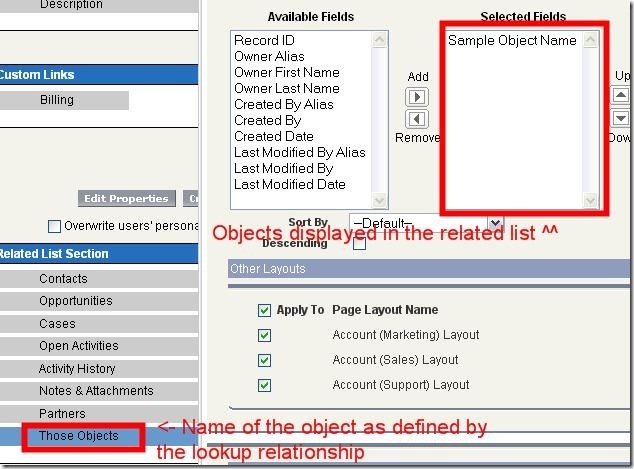 The displayed fields within a related list are controlled by the page layout; the name of the related list is determined by the lookup/master-detail relationship on the other object (see customize a related list below). Page layouts are assigned by profile and by record type. Every object that is associated with a tab will have at least one list view. No tab, no list view. You can assign filter criteria to your list view (just like a report). You can assign list views to: yourself only, groups, and roles. To print a list view click the printable view button on the top right of the page. Printable list-views can be disabled org wide (user interface settings). 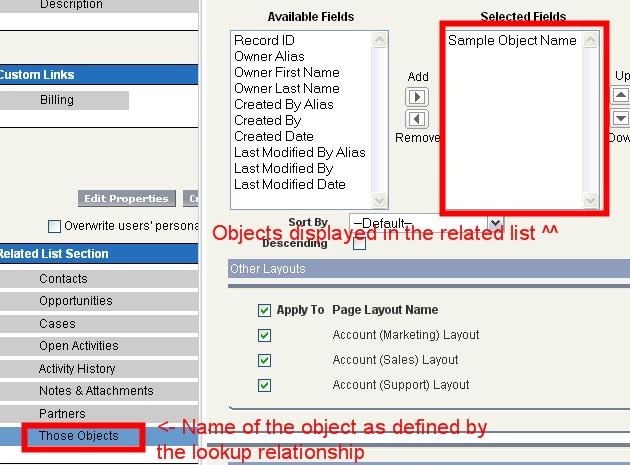 Exmple: Custom object "Sample Object" lookup relationship to account. Rename the related list from the object doing the looking- in this case edit the lookup to account. Notice the label in the bottom right "Those Objects". The record type "Master" is always present for every object, but is not listed under the record types list. It contains all picklist/process options. It can be assigned as a record type for a profile so long is it the only assigned record type for that profile. Each record type is assigned to 1 page layout type per profile. This means if you have two custom record types for account and 5 profiles, you will have 15 page assignments (5×2 for each custom, and 5 for Master). Selectable record types are assigned per profile. Field-level security is configured separately for each record type. What record types are associated with the current profile? If more than 1 record type, prompt user for record type selection. If just 1, select that record type without prompting. Based upon record type and profile, assign appropriate page layout. Based upon record type, assign the appropriate process and picklist values. Exampe: My sales staff sells an opportunity that represents a contract. My customer service department can then upsell on this contract. I would create two sales processes, two different record types, and two different page layouts: "Contract" and "CSR Upsell". I would create a lookup relationship from opportunity to opportunity, and only require/display this only for the CSR profile. I would also configure the roles of the organization so that they could not modify each others’ opportunities. Apply whatever security is most restrictive between the page layout and field level security of the profile. Administrative Setup –> Security Controls –> Field Accessibility. This will allow you to view by fields, profiles, or record types. Administrative Setup –> Manage Users –> Profiles. This will allow you to configure field-level security per profile.